No, it’s not a Sixties pop group. It’s my final blog in the Simeon Series. Earlier this month, I was booked to speak at Drumglass Parish Bible Study at St Elizabeth’s Moygashel. I checked out their website and found this. On 8th December we have the first of our visiting speakers when John Hamilton of Wycliffe Bible Translators will be telling us of the work of the mission that he works for. John has always been an entertaining and provocative speaker, and we look forward to hearing him again. Please come and join us if you are free. The offertory will be given to him for his work. Three thoughts sprung to mind: 1. Always good as a speaker to get unexpected encouragement 2. Hope they weren’t disappointed and 3. The offering cheque arrived in the office and very generous it was too! But why am I twittering on about Drumglass Parish? Well, the thoughts and stories contained in the Simeon Series were tried out on the good folks of Drumglass – and I thank them for their attention and some great questions afterwards. And so to Simeon and The Five Silhouettes: you see recently I too have been identifying with Simeon, a man who had to wait. Let me explain… the last time someone from Ireland north or south applied to become a Wycliffe member was in the autumn of 2012. For 3 years no one was asking about joining Wycliffe. Why not, I thought. Were my colleagues and I not doing the right things, saying the right things, speaking in the right churches, putting the right message on social media or in our local publications? On 1 June 2015 we moved to a new office. We put a map of the world on the wall with photos of all our Irish members. Then we had an idea. We all thought of it at the same time. Why not start praying every day for new members? How many should we pray for? We sensed that God had prompted us to decide on five – the five silhouettes! And guess what? In October we had two people asking to start the application process. We were delighted! We’re praying them – three more to join them! So… me and Simeon..? Five years is not that long compared to the Kimyal man, the Ndali man, not to mention Bai Laurent the Kouya man who hasn’t appeared in this series – but it’s still very exciting when we see God answering our prayers. Are you reading this in Ireland? Could you be silhouette 3, 4 or 5? Contact us at Wycliffe Bible Translators UK and Ireland. Are you elsewhere in the world? Find your local Wycliffe organisation on Wycliffe Global Alliance website. 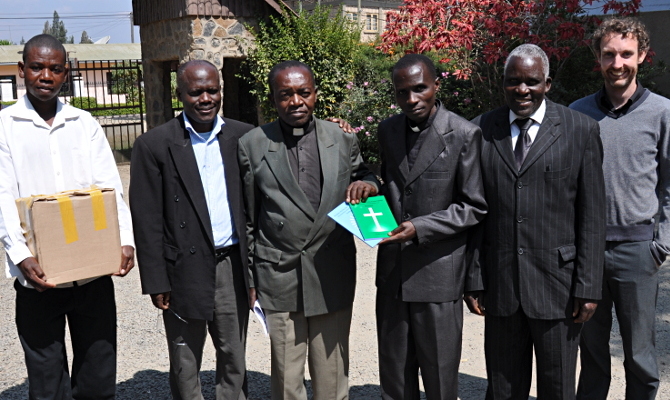 You can be part of Bible translation helping to relieve Bible Poverty so that there will be no more Simeons out there. So ends this post! The third in my Simeon Series… another story of people who have had that Simeon experience – waiting for a long time to experience something very important to them. 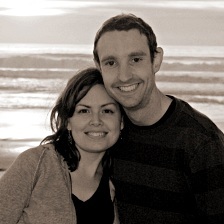 This time I am indebted to colleague, friend and one time member of the Wycliffe UK Mob Team, Mark Woodward and his wife Laura who write an excellent blog called Every Tongue. With Mark’s permission I am sharing his post entitled The people back home will not believe these books exist! Three unexpected guests arrived in our Mbeya office [in the south of Tanzania] this morning, asking to talk with the project manager. They were speakers of the Ndali language, and had traveled from the north of Malawi, having heard that we are translating parts of the Bible into the Tanzanian dialect of Ndali. And then the punchline, the Simeon experience! The first Simeon blog was The Simeon Series: who was Simeon? Following on from The Simeon Series: who was Simeon? I want to tell some stories of people who have had that Simeon experience – waiting for a long time to experience something very important to them. High in the Eastern Highlands of Indonesia, a crowd waits at the edge of an isolated runway. The silence is broken only by the occasional sound of weeping and wailing. A small plane can be heard approaching. The wheels touch-down. The plane slows to a stop. Boxes are handed down and, as if at a signal, pandemonium breaks out. The Kimyal people have the New Testament in their heart language for the first time. It’s a translation story spanning decades. In 1968, work on the translation was abruptly halted when two missionaries to the Kimyal people, Phil Masters and Stan Dale, were martyred by a neighbouring tribe. The work lay dormant until 1995 when a translation team under the supervision of Bible Society Translation Consultant, Dr Lourens de Vries, took it up once again. The promise that you gave Simeon that he would see Jesus Christ and hold him in his arms before he died. I also have been waiting under that same promise, O God. You looked at all the different languages and chose which ones will be put into Your Word. You thought that we should see Your Word in our language. Today, the day you had chosen for this to be fulfilled, has come to pass. O God, today you have placed Your Word into my hands, just like you promised. You have placed it here in our land. And for all this, O God, I give you praise. Amen. The Simeon Series: who was Simeon? Some thoughts on Simeon, a minor but very significant character in the Christmas story. But first, let’s refresh our memory of Luke’s Simeon. ‘Sovereign Lord, as you have promised, you may now dismiss your servant in peace. For my eyes have seen your salvation,which you have prepared in the sight of all nations: a light for revelation to the Gentiles, and the glory of your people Israel. And that’s all that the Bible tells us about Simeon: a man who had heard God’s promise and had waited (presumably for quite some time) to see the Messiah face to face. He held Jesus in his arms, he prayed to God and he prophesied. The context suggests that he probably died soon after, but we don’t know that. Simeon is an intriguing participant in the early life of Jesus – but wouldn’t it be great to know more about him? So I did some Googling and found this in Simeon’s Wikipedia entry. According to a tradition in the Eastern Orthodox Church, Simeon had been one of the seventy-two translators of the Septuagint. As he hesitated over the translation of Isaiah 7:14 (LXX: “Behold, a virgin shall conceive…”) and was going to correct it to γυνή (woman), an angel appeared to him and told him that he would not die until he had seen the Christ born of a virgin. This would make him well over two hundred years old at the time of the meeting described in Luke, and therefore miraculously long-lived. Now that’s intriguing too, but not very credible. I think I had heard of Candlemas… vaguely, but would have been pushed to explain or describe it as part of the Christian calendar… until I was prompted by this post Thoughts at Candlemas from Richard Littledale about ten days ago. It encouraged me to do some Googling. I learned that Simeon’s meeting and recognition of the Christ child in the Temple at Jerusalem was part of Candlemas – for me the best part. Richard’s blog went on to quote this segment of a narrative sermon he wrote on Simeon’s encounter with Christ some years ago. I enjoyed the story and with Richard’s permission, share it with you now. As you read, reflect on Simeon’s unique joy in meeting Jesus – unique, yes, for him but available to all of us. And what an encouragement, if a little embarrassing, to Mary and Joseph, confirming the angel’s words to them both. Sometimes he wore it like a crown on his head – badge of office, attracting envy and admiration wherever he went. Other times, it was more like a heavy scarf – cumbersome, but reassuring about his old neck. Other times still, it was like a restless caged bird – fluttering and battering itself on the paper-thin walls of his heart. But it was always there. They lived together, these two. Every day, the two of them would make their way to the temple. In days gone by, he had gone with head held high to play his part. Nowadays there were younger, leaner men to take his place, and he preferred to watch. As many blazing summers had come and gone, so he had grown to know this place like the lines on his leathery hand. He knew every cracked flagstone and every scarred brick. He knew where the shadows fell on their daily march around the courtyards. He knew where the poorest would gather to watch without being seen. And where the rich would strut, preening their robes like peacocks for all to see. He knew where the smells of the bazaar would tumble over the temple walls like uninvited guests. And where the waft of incense would tug the soul to higher things. These days he liked to sit, rather than walk, in this hallowed place, and nurse the word in his heart. It had grown stronger of late, like a bell on a buoy at sea, clanging insistent in the distance. Today it was almost deafening. He could hardly hear a thing above its din by the time they arrived. Their eyes were furtive, this young couple, darting everywhere and clutching the baby’s helpless bundle tight, as if the whole world depended on it. Feeling his very head would burst with the noise, he took the child from them and shouted above the clanging word: “This is the child”. And then, in harmony now with the bell’s note, he spoke of promises fulfilled and eyes opened, of light shed from heaven and a sword to pierce the heart of the young woman who stood before him. Smiling at her, the light dancing in his watery eyes, he returned the child. It was over now, the waiting done. 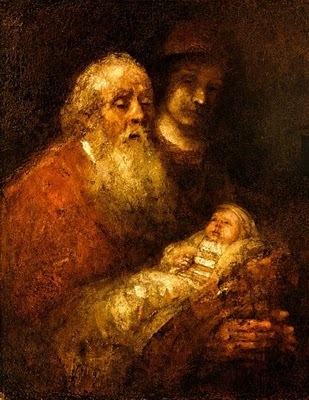 Simeon returned to the house of his birth. Returned to the arms of his Maker. And the word, set free from his heart, flew to other hearts and made its home. These are the kinds of feelings and responses that people have when introduced to Jesus through God’s Word in their heart language for the first time. That’s why I love being part of what Wycliffe Bible Translators does!